A fantastic match played by all teams. The atmosphere was electric at the end of both games, with the score going either way. Following a close first game of the season, the boys came out for their second game with extreme heart, hustle and focus. The Bulldogs held the lead through the first half with huge offensive contributions from Jose, Liam and Victor. Our team defence was stifling and created turnovers. In the second half our defence and hustle lead to more points. After trading a couple of baskets with Near North Montessori, we found ourselves tied at 15 with seconds of play left. Sohail raced down the court with two defenders, stopped and scored the game winning point. First Win of the season, 17-15!! Player of the Match: Sohail Sajdeh!! The girls work rate was superb during their match against Near North Montessori. 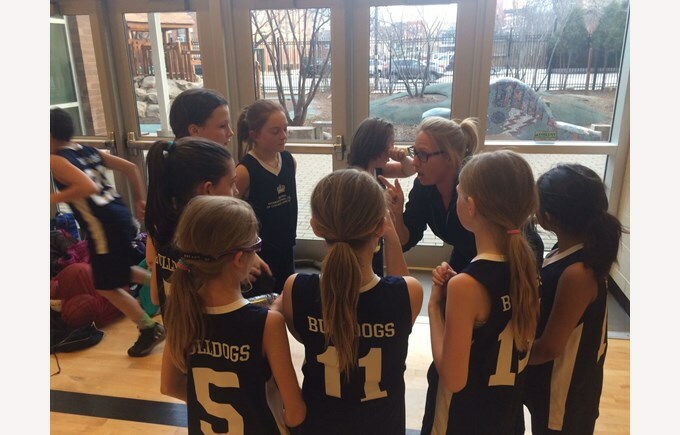 The Bulldogs Girls Team dominated possession in the 1st half, which reflected with a lead in the score. Casey's strength in the circle broke down Near North Montessori's defence, with Jen and Olivia both gaining some great rebounds. Some quick reactions from both Rebecca and Tara in the circle during defence gained momentum for our Captain Vanessa, Roya and Shayna's movement down the court, attacking the circle and gaining critical points. The team worked tirelessly towards the final buzzer for a 12-12 draw. 2 minutes of extra time were given to allocate a win. Only losing by one shot, the girls performance was one to leave the court with spirits high. Final score was 12-14. Player of the match: Casey Carnow! !